Nate Richards shows you how to play Shut Up and Dance on Guitar – FOR REAL! Linked above is a 5-page guitar tab and a YouTube video lesson tutorial on how to play everything in the song, including chords, power chords, lead guitar, rhythm guitar, intro, verse, chorus, bridge, guitar solo, picking and strumming – everything! Pop guitar songs are often taught in a watered-down, “easy version but not the real song” way on YouTube video lessons and tutorials for acoustic guitar or electric guitar. My goal with my guitar students is to teach them the actual song, to encourage them to put in the extra effort to learn the real thing, and be proud at the end that they have accomplished the task. Why? Not only is it a waste of time to purposefully learn a song wrong just because it is easier (which then also is a problem when you try to play with other students or musicians and no one knows the song the right way and that prevents them from making music together), but the student misses the opportunity to get a real guitar lesson from the artists themselves! That’s right – when you learn a song “to-the-T”, you’re getting an insight into how that person plays and composes on the guitar. So, if I learn Walk the Moon Shut Up and Dance on guitar, the guitarists are showing me “Hey, here’s how I play rhythm guitar chords,” or “Hey, check out how I solo using the Db minor pentatonic scale and hammer-ons.” Think of that pretend conversation with any of your favorite guitarists. I remember Kirk Hammett from Metallica was my hero, and I wanted to nail down his solos so I could learn from him exactly how he would solo, use scales and techniques, etc. I felt like I was learning trade secrets and uncovering treasures that few people will ever experience. Take the time to go through this lesson and once you know how to play Shut Up and Dance on guitar FOR REAL you will amaze your friends and family with your performance! It’s worth the extra effort – go big or go home! 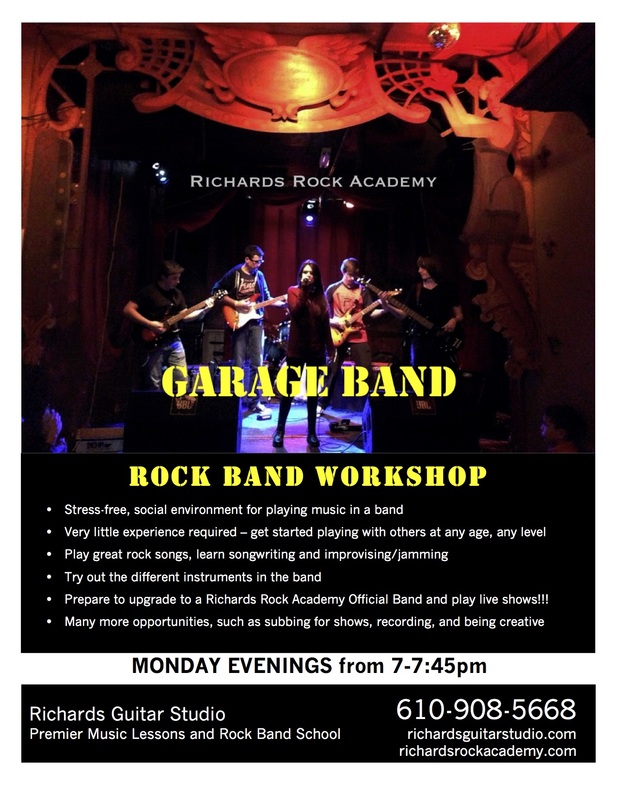 Richards Guitar Studio offers professional guitar lessons, bass lessons, drum lessons, music theory class, guitar teacher training, and rock band rock school in Aston, PA. Serving Swarthmore, Glen Mills, Ridley Park, Aston, and Delaware County, PA.